Successful cause marketing appeals not only to your head, but to your heart as well. The head part comes easier for me and probably for many of you as well. So how do you inject heart into a cause marketing campaign? Ulta’s answer is to ask people to write their breast cancer stories in a letter and then post them in the front windows of their stores. Ulta supports The Breast Cancer Research Foundation. Ulta is the largest discount cosmetics and fragrance retailer in the United States with more than 330 stores in some 38 States. There’s an Ulta store that I can almost coast down to from my house, so I went down there to check it out. The store devoted the better part of three of its four windows to the promotion. One of the window displays explained the promotion and the other two contained actual letters. The letters were unformatted. That is, so near as I could tell they were posted exactly as they were submitted. The challenge was that some of the letters appeared to be multi-page and it was sometimes tricky figuring out where some of the letters started and ended. Some letters contained names, some did not. In my cursory look I didn’t see any place information like city and State. Some of the letters appeared to have been seeded by Ulta employees. Some of the letters were about the person who had written the letter and some were about someone they knew and loved. But there were no pictures. That last one is a big problem in my opinion. Nothing helps me connect with someone emotionally like the ability to see the person who’s telling me their story. I know that there are privacy challenges, but I don’t think they’re insurmountable. And imagine how much more personally affecting the window display would have been if the people in the window not only included their picture, but were, in fact, from my area or at least my own State. Finally, when you look at the display from the sidewalk it’s just one big patch of gray. While color photos of the letter writers would help in this regard too, the letters themselves need to be on colored paper at least. And wouldn’t it be cool if the letters, when looked upon from afar, painted an image of the iconic pink ribbon that symbolizes breast cancer? This is an excellent post you wrote on Ulta's breast cancer campaign. I agree with your take on it 100%. While the cause is a good alignment with Ulta to take part in and their intentions were good, they completely missed the mark. I see it as a rather sophmoric approach to cause campaign support, good ideas but poor execution. In addition to your comments (right on too), I would add: there was no direct call to action, nothing. What were window shoppers asked to do or customers? The idea should have been in-store support. 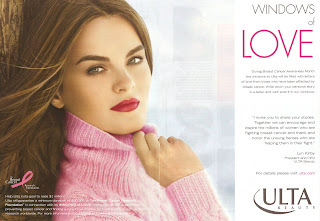 Also, it would have had a greater impact if they had local Ulta stores, connected to local breast cancer charity - with local women's stories and photos about their crusade against cancer. It is amazing to me that large companies do not invest in business giving or cause marketing experts. It's the one aspect of business where the benefits are manifold including increasing the bottom line when a campaign is done with a strategy. It is no longer a good thing to if they desire to make an impact on communities, causes and consumers. Your post is one good example. I agree, Maggie! This was a huge missed opportunity for both Ulta and the related cause. The lack of local connection to the cause, and the missing in-store enthusiasm ... yawn! Ulta should have issued pink t-shirts to all employees, which would have connected to the cause AND provided opportunities for the campaign to have some endurance (what others sometimes call legs). At minimum, couldn't the letters have been formatted to create a huge pink ribbon? Where was the co-branding? All retail organizations create "maps" for their displays so stores will have similiar looks. This campaign needed that visual direction. Thanks for your considered comments. I sense from both of you that you want Ulta to succeed in their cause marketing efforts. I'm confident that success in this endeavor is close for Ulta. Especially if it takes your terrific advice. I actually liked the campaign a lot but agree images and a call to action would help. I think there's an implicit call to action to share your story but more could be done. Thanks for everyone's thoughtful comments.